Finally, Robert Drasnin's conclusion to his epic Voodoo trilogy, with extensive liner notes explaining the painstaking process taken to assemble this album. Voodoo IIIwas finished after Drasnin's death in 2015 and released in a run of 150 CDRs, which sold out very quickly. Not only did the story of the record - started by Drasnin and brought to conclusion by his longtime collaborator Skip Heller - generate huge interest in the exotica community, but the music itself sealed Drasnin's legend. 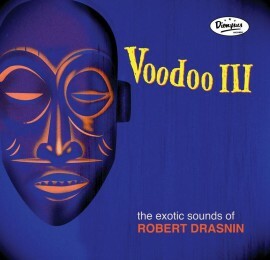 This release of Voodoo III, beautifully mastered, vinyl cut on a tube system with a vintage Scully lathe and Westrex 2B cutting head at HRS, with art by Claudette (Miss Fluff) Barjoud, and exhaustive production notes by Skip Heller, is the most important new exotica release of the year, possibly decade.